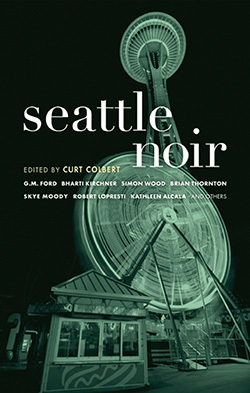 Edited by Curt Colbert, this anthology of Noir stories is part of the acclaimed Akashic Books city-based series of Noir short stories – each focusing on a different neighborhood in their respective cities – in this case, the Emerald City of Seattle. Each story is as diverse as every neighborhood. By the 1950s, Seattle had added Boeing to its claim to fame, but was still a mostly blue-collar burg that was once described as an “aesthetic dustbin” by Sir Thomas Beecham, a short-term conductor of the Seattle Symphony Orchestra. Present-Day Seattle has become a pricey, cosmopolitan center, home to Microsoft and legions of Starbucks latte lovers. The city is now famous as the birthplace of grunge music, and possesses a flourishing art, theater, and club scene that many would have thought improbable just a few decades ago. Yet some things never change—crime being one of them. Seattle’s evolution to high finance and high tech has provided even greater opportunity and reward to those who might be ethically, morally, or economically challenged (crooks, in other words)… This is Seattle Noir. Cozy up in your favorite easy chair and crack the book open. And be sure to turn up the lights—you’ll need them for when it gets dark.